Madison sells hillside mansions in Malibu. Chad sells $5MM penthouse units at the W. Josh sells his grandmothers dead friend’s Beverly Hills estates. David sells simplistic cottages in need of renovation very close to Geneva Lake. And so it goes, in my quest to list humble cottages in the best of locations, I offer you my latest listing conquest. 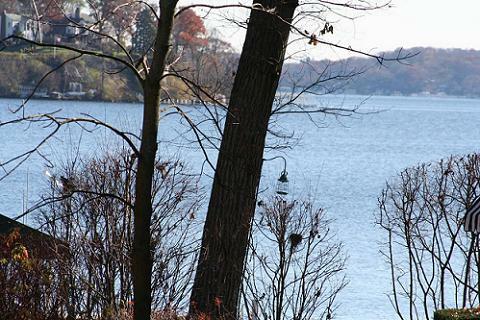 A humble cottage with a surprising architectural pedigree located not more than 250′ from the crystal clear, possibly theraputic, asian carp free waters of Geneva Lake. By now you probably know that I grew up on the lake in the Loch Vista Club. I spent my days splashing and fishing in the cleansing water, and now my children spend their own summer days in exactly the same fashion. The cottage that I just listed is in the Loch Vista Club, a club so classically Lake Geneva, that it’s hard to think of a more ideal lake access setting. The Club consists of two single lane roads, Upper Loch Vista and Lower Loch Vista, that both dead end at the lakefront. At the end of Upper Loch is the primary association park and pier, and at the end of Lower Loch you’ll find a much smaller, lesser used association pier. 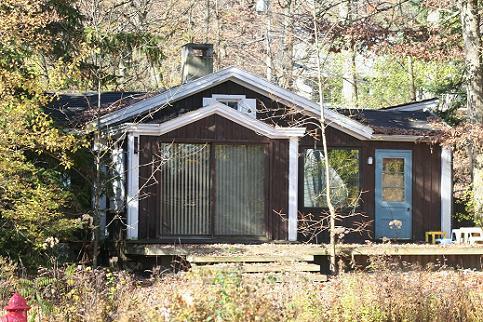 This cottage is located at the end of Lower Loch, just one home off the lake, with lake views galore. There is a lakefront home positioned in front of my cottage, and another lakefront home off to the south. These two homes frame the lake view, and both are classically designed, and meticulously maintained. The property that I’m selling for $414,900 consists of two platted parcels, the lakeside parcel hosts the existing home, and the rear parcel, that runs to the corner of Lower Loch Vista and Conference Point Road, is vacant. The property is being sold as a package, which would allow the future owner flexibility in building new, renovating, or applying for a variance to build a structure on the rear parcel as well. The existing cottage does have some really cool features, as it’s kind of a hybrid blend between a classic cottage (fir floors, built ins, big masonry fireplace), and modern as it was defined some 80 years ago when the home was built. Throw is a dash of asian inspired design, and you have this cottage. It needs a major renovation, as the last few years of neglect (the owners from Massachussets, whose family had owned this home since its construction, had passed away) have led to a water issue in the basement that has been left untouched. The truth is, I don’t care much about water problems, or the fact that this cottage needs to be renovated (it’s solid, just damp). Or the fact that someone might just tear it down and start from scratch. It’s not about the cottage, it’s about the land and the location. If you only care about buying a shiny fancy brand new house, and care little about the location, just buy one in Illinois and save yourself the trip. If you’re looking for a location where you can sit on your deck and hear the waves hitting the shore, and the boats rumbling past, then we’re in business. I don’t care much for fancy homes in boring locations, and that may be why these small cottages tucked in close to the lakefront make me so excited. The lakefront home directly in front of this cottage sold a few years ago for $2.2MM. It’s small, cottage like, but of superior fit and finish. This cottage of mine can be bought, with two lots, for around $400k, and you get to enjoy the same setting and a similar vacation home experience as the guy in the $2.2MM house, except that you’ll have kept much more money in your pocket. If you’re looking for a Lake Geneva rehab project, this place might be the perfect home for you. If you’re more concerned about quality of location and price than you are worried about having a Viking stove like you have back home, then you and I need to talk a little further about this property. I believe this is one that will sell fairly quickly, as we have listed it for around $100k less than the appraised value from just this fall. If you’re interested, email me and I can send you the survey and more detailed information. Consider this cottage, and perhaps next summer, I really will see you at the lake.